The Igor Belousov search-and-rescue vessel is planned to be commissioned by the Russian Navy in November 2015. Image courtesy of Admiralteiskie Verfi (Admiralty Shipyards). The Igor Belousov vessel was launched in October 2012. Image courtesy of Admiralteiskie Verfi (Admiralty Shipyards). The search-and-rescue vessel has a maximum speed of 15k. Image courtesy of Admiralteiskie Verfi (Admiralty Shipyards). A Ka-27PS naval helicopter performed landing operations on the Igor Belousov during the latter’s sea trials in April 2015. Image courtesy of Ministry of Defence of the Russian Federation. The Igor Belousov (Project 21300) maritime search-and-rescue support vessel is designed by JSC CMDB Almaz and built by JSC Admiralteiskie Verfi (Admiralty Shipyards) in St Petersburg, Russia. It is planned to be inducted into the Russian Navy’s Pacific Ocean Fleet search-and-rescue force in November 2015. The vessel is intended for search-and-rescue of crew in distressed surface vessels and submarines. It can also be used for providing emergency response and ship salvage. The Ministry of Defence of the Russian Federation plans to procure a series of five Igor Belousov rescue ships to enhance the Russian Navy’s search-and-rescue capabilities. The keel for the first Igor Belousov search-and-rescue vessel was laid in December 2005 and the vessel was launched in October 2012. The Russian Navy crew performed testing of life support systems, propulsion systems and radio navigation equipment installed in the vessel during the first phase of factory sea trials in the Baltic Sea between December 2014 and January 2015. "The vessel is intended for search-and-rescue of crew in distressed surface vessels and submarines." The second and third phases of sea trials were conducted in the Baltic Sea between January and March 2015. A Ka-27PS maritime naval helicopter performed 32 landings on the Igor Belousov salvage ship as part of sea trials conducted in April 2015. The vessel entered fourth and final stage of factory sea trails in landfills Baltic Sea and Atlantic waters in August 2015. The final testing phase will include inter-agency and interdepartmental testing of the design equipment. 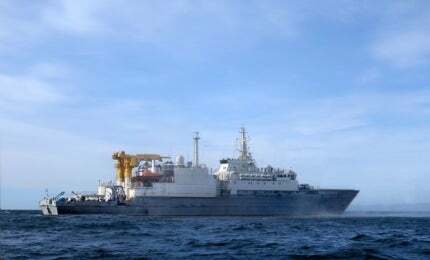 The Igor Belousov vessel has a waterline length of 97.8m, width of 17.2m, and depth amidships of 10.6m. It has a crew of 96 members and is fitted with spare beds to accommodate 120 rescued personnel. The vessel, with a displacement of 5,037t, is integrated with sensors, and medical and lifesaving equipment. It can carry a Bester-1 deep submergence rescue vehicle, designed by the Lazurit Central Design Bureau, for improved rescue capability. The Bester-1 vehicle is operated by six people and can house up to 22 rescued personnel. The deck is equipped with a helipad to support air rescue operations by a single helicopter. The maritime search-and-rescue vessel is equipped with underwater communication systems, navigation complex, search equipment, as well as hydrological measuring equipment. The navigation suite comprises automatic navigation system, sonar, hydro-acoustic navigation system, navigational radar, and hydro-meteorological support systems. The first Ocean Eagle 43 trimaran ocean patrol vessel ordered by the Mozambican Government was launched in January 2015..
A 450m deep saturation diving system, designed and manufactured by Divex, is installed to support the deployment of 12 divers in saturation. It features a central transfer-under-pressure chamber, four accommodation chambers for 60 personnel, a three-man diving bell, and a control system. The on-board lifesaving equipment include a 700m deep-diving vehicle and two ARS-600 double-hulled, deep-diving submersibles. Operated by two crew members, the ARS-600 submersible is used for search and lifting of underwater objects from the seabed and rescue of crews in distressed submarines. The search-and-rescue vessel’s propulsion system consists of two 2,400kW Schorch KL6538B-AS06 electric motors, four 1,680kW VA-1680 diesel generators, and two 1,080kW VA-1080 diesel generators. Electric propulsion systems of the vessel include two 2,400kW propulsion motors, Aquamaster US 305FP two-circle rudder propellers, two 680kW bow thrusters, two CGW 1.0 / 5-M automated boilers, and an auxiliary power unit. The ship can cruise at a maximum speed of 15k, has a cruising range of 3,500 miles, and can endure for up to 30 days. Vestdavit designs, supplies and supports tailor-made solutions for launching and recovering boats in difficult conditions at sea. Its davits get boarding parties in rigid inflatable boats (RIBs) away and safely back on board in extreme conditions.